Antivascular endothelial growth factor (VEGF) treatment is still used intravitreally worldwide for various neovascular diseases, despite other available, approved treatments. We performed a systematic search of the literature focused on visual physiology studies. We used the online biomedical search engine PubMed and searched key words including “M-chart,” “Preferential Hyperacuity Perimetry,” “microperimetry,” (MP) “electroretinography,” and “contrast sensitivity” to estimate treatment efficacy of anti-VEGF treatments in a quantitative manner. Many studies were identified which used a variety of methodologies, disease entities, injected agents, and patient populations, making it difficult to obtain a direct comparison of their results. However, favorable functional outcomes achieved using current quantitative methods would lend further confidence to the effectiveness of a treat-and-extend protocol using intravitreal anti-VEGF for the management of patients with neovascular diseases. Despite anti-VEGF's wide use, a well-designed longitudinal multicenter study to systematically evaluate and compare different physiological methods or parameters in patients with neovascular diseases is still lacking, though it would benefit therapeutic decisions. Angiogenesis is the process of formation of new capillaries from preexisting blood vessels, which is involved in many pathologic states associated with the formation of new blood vessels. Many pathologic ocular conditions result in vision loss due primarily to angiogenesis, including choroidal neovascularization (CNV) in age-related macular disease (AMD), retinal neovascularization in diabetic retinopathy (DMR), retinal vein occlusion (RVO), and retinopathy of prematurity (ROP).,,, As early as 1948, Michaelson  hypothesized that an increasing concentration of a diffusible molecule in the retina, which he referred to as “factor X,” was the primary cause of abnormal blood vessel growth in the eye. Early preclinical and clinical studies have since identified vascular endothelial growth factor (VEGF) as a major factor in the principal mechanism behind neovascularization.,,,,,,,,,, Although the pathogenesis of neovascular disease is not fully understood, inhibition of VEGF has been shown to be an effective method for anatomic and functional outcomes in patients with neovascularization. Although it is generally recognized that higher best-corrected VA (BCVA) is correlated with better vision, BCVA does not indicate exclusive information regarding retinal function when changes in VA are minimal and is often within the range of variability of the test.,, Distance VA is a reflection of resolution at the foveola, representing acuity in the central 1° of the visual field (VF). Moreover, VA has shown poor correlation with both qualitative and quantitative imaging assessments of macular morphology. Based on clinical experience, morphologic deterioration does not immediately affect VA. Indeed, brain mechanisms can compensate for retinal malfunction and often delay the typical symptoms of neovascularization recurrence until the lesion is relatively large and subfoveal. The availability of an objective and easily performed functional test that correlates well with macular morphology and has a capacity to evaluate the response of not only the foveola but also the larger macular area would markedly change current clinical practice, allowing for fewer monitoring visits. Various types of functional assays have been compared in terms of their diagnostic capacity, reproducibility, and clinical applicability in identifying the tests with the greatest potential to evaluate the efficacy of a given therapy. In this review, we address quantitative tests that cover a wide array of functional assessments in response to anti-VEGF therapy, beyond measurement of VA. Evaluation with a different transformation of visual function parameters would allow more information to be gathered for an early response and might act as a more effective method of disease monitoring. To ensure accuracy, this literature review was conducted according to the Preferred Reporting Items for Systematic Reviews and Meta-analyses statement. A comprehensive search of the literature was conducted for papers using the online biomedical search engine PubMed, Embase, and the Cochrane library. The following terms were used for the searches: neovascular retinal diseases AND (anti-VEGF treatment OR anti-VEGF therapy) AND (M chart OR preferential hyperacuity perimetry (PHP) OR electroretinography (ERG) OR microperimetry (MP) OR contrast sensitivity [CS]). The two authors (IHH and SPP) identified articles using anti-VEGF agents in the management of retinal diseases with varying pathophysiologies that share a common final pathway of pathologic neovascularization. Anti-VEGF therapy was administered either as stand-alone therapy or combined with other interventions, without consideration of injection dose or frequency. All relevant articles were included in this review. Limits for our literature search filters included papers published in English between 1987 and March 2017, including human studies published as randomized controlled trials and nonrandomized comparative studies (cohort or retrospective studies or case–control series). Anti-VEGF uses in ROP and animal studies, editorials, review articles, letters to the editor, and meeting abstracts were excluded from this review. A total of 219 articles were initially identified from a literature search. Of these, 46 studies were selected for review after checking for inclusion and exclusion criteria. The studies are summarized in [Table 1], [Table 2], [Table 3], [Table 4]. Patients with advanced macular disease, particularly with neovascular AMD and DME, often complain of metamorphopsia, a phenomenon defined as an observed deformation of straight lines due to the displacement of photoreceptors. As metamorphopsia significantly correlates with a patient's vision-related quality of life, many tests have been introduced to evaluate the distorted vision. The Amsler grid, introduced in 1947, consists of evenly spaced horizontal and vertical lines and has been commonly used to test for metamorphopsia. Although the Amsler grid is inexpensive, straightforward, and easily understood by the patient, the results are only descriptive; they are neither precise nor reproducible. Importantly, the grid can only assess abnormal findings qualitatively; direct quantitative analysis of impairment is not possible. Thus, it is difficult to monitor metamorphopsia over time and to evaluate the efficacy of anti-VEGF treatments. 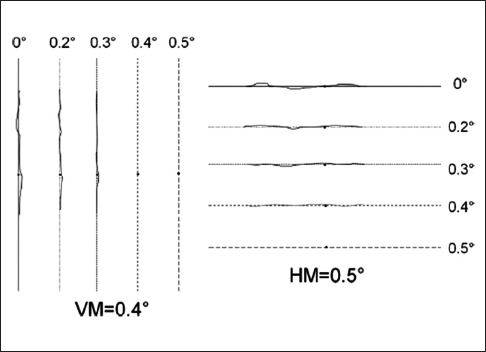 The M-chart, a diagnostic tool developed by Matsumoto, includes a set of dotted line printouts that can be used to score metamorphopsia according to the minimum dotted line interval needed to null the visual distortion of the patient [Figure 1]., M-chart is a simple, reliable tool to quantify metamorphopsia, and have been adopted in several studies to evaluate response to anti-VEGF treatments ,, [Table 1]. Nowomiejska et al. first reported a comparison of M-chart and Amsler grid results with optical coherence tomography (OCT) results in an assessment of metamorphopsia in patients with wet AMD treated with intravitreal bevacizumab injections. Similar assessments were used in patients with DME and RVO., They found that the M-score decreased significantly after anti-VEGF treatment in patients with AMD and DME and concluded that treatment efficacy can potentially be assessed by calculating M-score changes in patients with metamorphopsia. However, the M-score did not decrease in patients with RVO, and different results were obtained between the two studies when comparing M-score with BCVA and anatomical results from OCT. A longer follow-up is needed to determine if M-charts can be a complementary test to anatomical imaging and BCVA testing. An alternative to M-charts is the PHP test, which has recently gained popularity as a device for monitoring visual distortion in patients with CNV., PHP uses hyperacuity to detect and quantify the severity of visual defects associated with the development of neovascularization, such as metamorphopsia and scotoma within the central 14° of the visual field. PHP has been used in several studies to quantify metamorphopsia in patients with AMD treated with ranibizumab [Table 1].,, After intravitreal ranibizumab injection, the PHP metamorphopsia test score significantly improved. The clinical observations indicated good correspondence between the results from PHP tests and macular morphology whereas changes in BCVA did not significantly correlate with changes in any of the OCT metrics or PHP tests. These findings suggest that PHP tests may be a useful tool to monitor the response to anti-VEGF treatment in a quantitative manner. However, further investigations are needed to establish the sensitivity of PHP compared with other functional and morphological measurements in patients undergoing anti-VEGF treatment for other vitreoretinal neovascular diseases. Routine functional measurement of vision, such as Snellen or ETDRS charts, may not reflect local macular (extrafoveal) retinal dysfunction. Perimetry examines the sensitivity of different locations of the retina and reflects retinal morphology., MP, which combines digital fundus imaging with automated perimetry, can quantify the sensitivity of the central retina in a precise fundus-related position, allowing precise quantification of retinal function at specific loci and subsequent correlation with anatomic findings at that locus [Figure 2]. Furthermore, these noninvasive procedures have an automatic eye tracker that compensates for eye movements during the examination, analyzing macular function even when fixation is unstable. 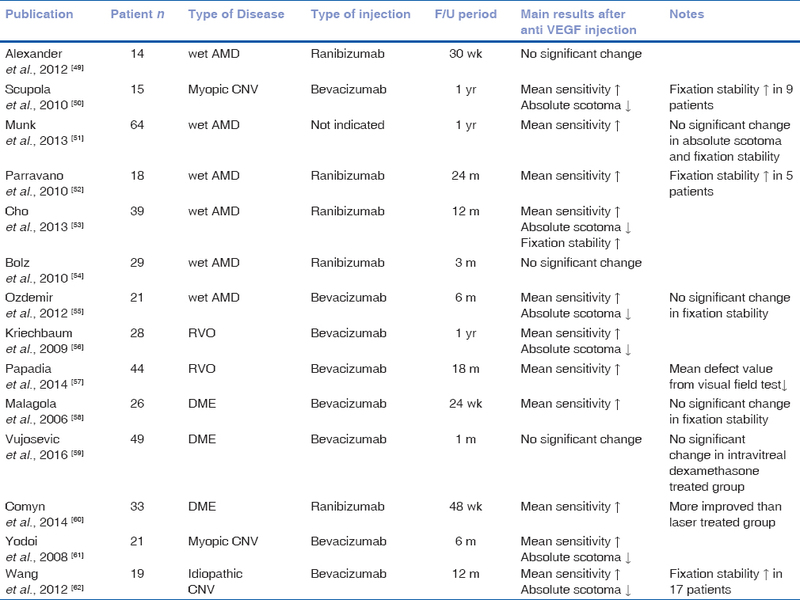 The value of such evaluations with MP has been previously reported in numerous studies assessing the efficacy and safety of anti-VEGF treatment in eyes with wet AMD,,,,,, macular edema secondary to RVO,, DMR,,, and myopic CNV.,, [Table 2]. Useful information on macular function can be obtained by MP parameters, including macular sensitivities, size of dense scotoma, fixation stability, and fixation location. Parallel to VA and anatomical improvement, most studies showed improvement of MP parameters after treatment in spite of the differences in patient characteristics, disease entities, and anti-VEGF therapy.,,,,,,,,,, Macular sensitivity increase, absolute scotoma reduction, and stabilization of fixation estimated by MP strongly support evidence of macular function recovery, as suggested by other functional outcomes, after intravitreal anti-VEGF injections for neovascular disease. However, according to statistical analysis of the correlation with VA and OCT, the results were variable. In a study evaluating the association between functional and anatomic changes during intravitreal bevacizumab treatment in patients with CME secondary to RVO, statistical analysis revealed significant associations among BCVA, macular sensitivity, and OCT parameters. However, Scupola et al. found no statistical correlation between the functional changes of BCVA or macular sensitivity and macular thickness reduction. Interestingly, Parravano et al. and Cho et al. used ranibizumab to treat patients with nvAMD and noted that although VA and retinal thickness changes were greatest at 4 weeks to 6 months after intravitreal ranibizumab treatment, retinal sensitivity was highest at 12–24 months after treatment. These results suggest that MP may yield additional information about macular function that is not available with VA or OCT measurements alone. Among patients with central RVO (CRVO), VF tests were performed to distinguish ischemic from patients without ischemia. Thus, average mean defect values were measured after intravitreal anti-VEGF injections. Although two functional parameters, computerized VFT and MP, were useful and complementary for monitoring evolution, MP was more favorable in the injection group, reflecting extramacular damage (edema). Multifocal ERG (mfERG), developed by Sutter and Tran, is an objective test which reflects the photopic electrical responses to discrete portions of the central of vision and a promising tool for the assessment of retinal function with identification when lesion-associated recordings are identified and analyzed. 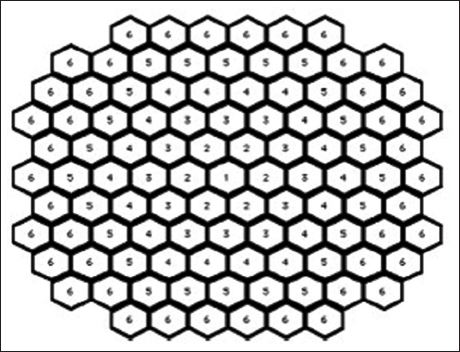 By rapidly flickering stimuli consisting of black and white hexagons in a pseudorandom m-sequence on a monitor, the retinal responses corresponding to an area of ±25° of the central vision can be mapped. The waveform of mfERG can be considered as a combination of ON and OFF-bipolar cell contributions and smaller contributions from the inner retina and photoreceptors. The P1 and N1 components of the mfERG from several concentric rings centered on the fovea were averaged, and the mean amplitude and mean implicit time of P1 and N1 from each ring summation were analyzed [Figure 3]. Neovascularization and related macular diseases generally depress the central peak response density, which is additionally altered in the presence of macular edema. Thus, many studies have described and quantified the electrical activity of the macula using mfERG, and as a result, have also evaluated its function after injection of anti-VEGF agents.,,,,,,,,,, The results from studies using mfERG to quantify anti-VEGF treatment are summarized in [Table 3]. The improvement of P1 and N1 amplitude in the central fovea and lack of deterioration of mfERG wave parameters reported in several studies suggest that the off-label use of anti-VEGF therapy could initiate recovery of cellular function of the retina and is probably nontoxic to the retina. In pattern electroretinogram (PERG), the P50 wave is partially generated from ganglion cells with significant contribution from retinal neurons distal to the ganglion cell, thus depending on the functional integrity of the macular photoreceptors. The N95 wave is derived in relation to retinal ganglion cell function of the central part of the retina. The results from the analysis of these electrophysiological responses contribute comprehensive information about macular function during anti-VEGF treatment. 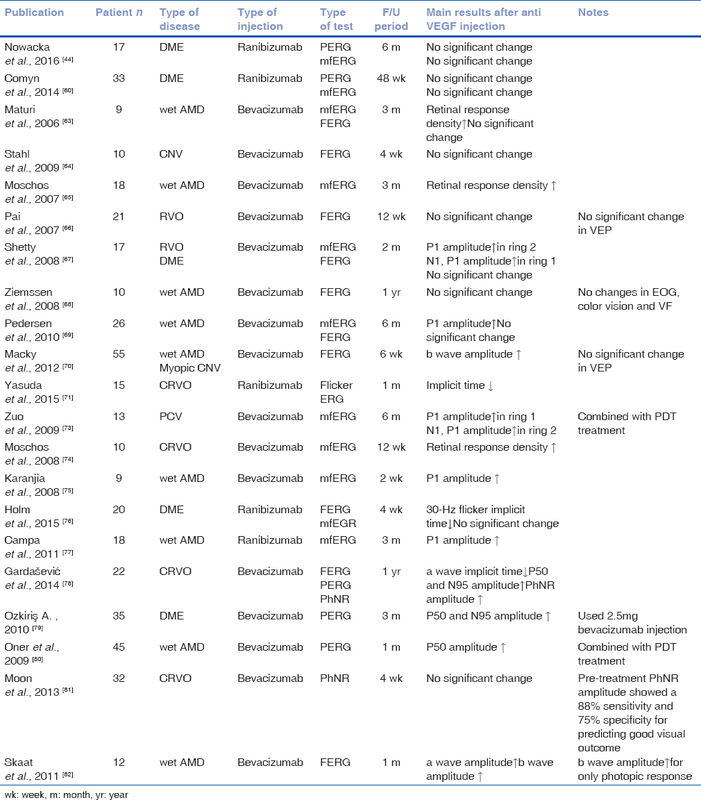 Based on this theory, several authors have used PERG to evaluate the change of macular function in patients with CRVO, DME,,, and neovascular AMD  [Table 3]. Although the results of PERG examinations revealed no improvement in patients with DME treated with ranibizumab, Ozkiris  showed that an intravitreal injection of 2.5 mg bevacizumab appeared to be effective for treatment of diffuse DME, with an increase in both VA and P50 amplitudes. To additionally investigate the effect of anti-VEGF treatment on the inner retina, the photopic negative response (PhNR) was recorded in patients with CRVO., This slow negative potential, which follows the b-wave of the photopic ERG, most likely originates from spiking activity of the retinal ganglion cells and their axons receiving signals from cones. However, Moon et al. and Gardaševic et al. reported a significant improvement of PhNR amplitudes after 1 year of treatment. However, direct comparison of the outcomes of the two studies is difficult because their treatment regimens were different. Most ERG studies that used VA and OCT assessment methods reported an improvement in VA and/or a reduction in central retinal thickness after anti-VEGF treatment.,,,,,,,, However, neither the correlation between VA and ERG results nor the correlation between central retinal thickness and ERG results is clear. There was no significant electrophysiological change accompanied by significant reduction in OCT thickness and/or improvement in VA ,,, while some mfERG studies reported that the mfERG improvement was significant, it was disproportional to the degree of macular thickness.,,, Campa et al. showed that the proportion of patients with a definitive improvement after a course of ranibizumab treatment was twice as high and occurred much earlier when considering mfERG response compared with BCVA, suggesting that mfERG may be more sensitive to improvements in macular function. Distance VA has many drawbacks, as it assesses the ability to resolve detail only at high contrast, while real objects have different degrees of variability in contrast and spatial frequency. CS testing allows measurement of the patient's ability to see low contrast patterns and provides additional information on visual function., In particular, CS may be a better predictor of performance in tasks requiring distance judgment of real targets, night driving, and mobility than conventional VA. CS is closely linked with both orientation and mobility, and, in patients with macular disease, may be markedly reduced despite near-normal distance VA. The CS of each patient's affected eye was measured using the commercially available Pelli-Robson chart (Clement Clarke Inc., Harlow, UK), VCTS 6500 chart (Vistech Consultants Incorporation, Dayton, Ohio, USA), Chroma test (City University, London, UK), and Functional Acuity Contrast Test (FACT) chart (Stereo Optical, Inc., Chicago, IL., USA). Because CS is dominated by retina function, increases in this functional assessment may reflect the recovery of retinal function after treatment. As a result, clinical protocols including CS testing have been used to evaluate the effect of anti-VEGF treatment and showed the variable anti-VEGF treatment strategies lead to improvement in CS in patients with wet AMD,,,,, ME from RVO , and DMR,, and polypoidal choroidal vasculopathy (PCV). [Table 4] Randomized clinical trials demonstrated that intravitreal anti-VEGF therapy could initiate a larger increase in CS than conventional laser treatment in patients with DMR., One-year findings from the IVAN randomized trial revealed that CS did not differ significantly between drugs or treatment regimens in patients with wet AMD. Low spatial frequencies have a crucial role in perception of real targets, and middle spatial frequencies have more influence on orientation and mobility and are not related to VA. Thus, these results suggest that the intravitreal injection of anti-VEGF agents can improve the quality of life for patients with neovascular diseases through an increase in CS. The present review provides valuable information on various characteristics of physiological biomarkers in neovascular diseases and shows that VA change or OCT alone may not be the optimal parameter(s) for evaluating the efficacy of anti-VEGF treatments. There has been conflicting data regarding the improvement of visual function in patients with neovascularization who were treated with intravitreal anti-VEGF injections. In part, this has been attributed to heterogeneity within a patient cohort in terms of severity, a multitude of confounding factors and underlying etiologies in neovascularization, differences in the frequency of injections and pharmacokinetics between anti-VEGF agents, unreliable evaluation pre- and post-treatment, and the overall variability in measurements of clinical signs. Our review focused on methodological issues, including various neovascular disorders and anti-VEGF agents; we disregarded the anti-VEGF treatment regimen, making it difficult to compare the outcome of a single anti-VEGF agent against a single functional assessment. A lot of novel and unique physiological tests have been available recently, including functional OCT, chromatic contrast, investigating changes of preferred retinal location and vision-related quality of life.,,, However, this review has a limitation that we only included quantitative measurement methods, which we considered more accessible in general clinical settings. Nevertheless, our review proved that intravitreal injection of anti-VEGF agents appear safe and may offer a new therapeutic opportunity for neovascular diseases with a significant impact on visual function. Although VA is an important and well-established physiological test to assess the efficacy of anti-VEGF treatments in clinical trials, it does not seem to comprehensively reflect overall visual function gain or improvement in vision-related quality of life. Additional visual function variables, we addressed should be examined in routine clinical practice as well as in multicenter trials to quantify the efficacy of anti-VEGF treatment and correlate with valuable morphological outcomes. It is therefore of great importance to improve our understanding of retinal neovascularization so we can develop more detailed recommendations regarding when and when not to start treatment. Physiological testing will be an objective way, in which to continue this work. Ciulla TA, Rosenfeld PJ. Anti-vascular endothelial growth factor therapy for neovascular ocular diseases other than age-related macular degeneration. Curr Opin Ophthalmol 2009;20:166-74. Andreoli CM, Miller JW. Anti-vascular endothelial growth factor therapy for ocular neovascular disease. Curr Opin Ophthalmol 2007;18:502-8. Jain RK. Molecular regulation of vessel maturation. Nat Med 2003;9:685-93. Michaelson IC. The mode of development of the vascular system of the retina with some observations on its significance for certain retinal disorders. Trans Ophthalmol Soc UK 1948;68:137-80. Gilbert RE, Vranes D, Berka JL, Kelly DJ, Cox A, Wu LL, et al. Vascular endothelial growth factor and its receptors in control and diabetic rat eyes. Lab Invest 1998;78:1017-27. Pe'er J, Shweiki D, Itin A, Hemo I, Gnessin H, Keshet E. Hypoxia-induced expression of vascular endothelial growth factor by retinal cells is a common factor in neovascularizing ocular diseases. Lab Invest 1995;72:638-45. Shima DT, Gougos A, Miller JW, Tolentino M, Robinson G, Adamis AP, et al. Cloning and mRNA expression of vascular endothelial growth factor in ischemic retinas of Macaca fascicularis. Invest Ophthalmol Vis Sci 1996;37:1334-40. Krzystolik MG, Afshari MA, Adamis AP, Gaudreault J, Gragoudas ES, Michaud NA, et al. Prevention of experimental choroidal neovascularization with intravitreal anti-vascular endothelial growth factor antibody fragment. Arch Ophthalmol 2002;120:338-46. Wells JA, Murthy R, Chibber R, Nunn A, Molinatti PA, Kohner EM, et al. Levels of vascular endothelial growth factor are elevated in the vitreous of patients with subretinal neovascularisation. Br J Ophthalmol 1996;80:363-6. Adamis AP, Miller JW, Bernal MT, D'Amico DJ, Folkman J, Yeo TK, et al. Increased vascular endothelial growth factor levels in the vitreous of eyes with proliferative diabetic retinopathy. Am J Ophthalmol 1994;118:445-50. Noma H, Minamoto A, Funatsu H, Tsukamoto H, Nakano K, Yamashita H, et al. Intravitreal levels of vascular endothelial growth factor and interleukin-6 are correlated with macular edema in branch retinal vein occlusion. Graefes Arch Clin Exp Ophthalmol 2006;244:309-15. Rosenfeld PJ, Brown DM, Heier JS, Boyer DS, Kaiser PK, Chung CY, et al. Ranibizumab for neovascular age-related macular degeneration. N Engl J Med 2006;355:1419-31. Brown DM, Michels M, Kaiser PK, Heier JS, Sy JP, Ianchulev T; ANCHOR Study Group. Ranibizumab versus verteporfin photodynamic therapy for neovascular age-related macular degeneration: Two-year results of the ANCHOR study. Ophthalmology 2009;116:57-65.e5. Ho AC, Busbee BG, Regillo CD, Wieland MR, Van Everen SA, Li Z, et al. Twenty-four-month efficacy and safety of 0.5 mg or 2.0 mg ranibizumab in patients with subfoveal neovascular age-related macular degeneration. Ophthalmology 2014;121:2181-92. Amoaku WM, Chakravarthy U, Gale R, Gavin M, Ghanchi F, Gibson J, et al. Defining response to anti-VEGF therapies in neovascular AMD. Eye (Lond) 2015;29:721-31. Dimitrov PN, Robman LD, Varsamidis M, Aung KZ, Makeyeva GA, Guymer RH, et al. Visual function tests as potential biomarkers in age-related macular degeneration. Invest Ophthalmol Vis Sci 2011;52:9457-69. Keane PA, Patel PJ, Liakopoulos S, Heussen FM, Sadda SR, Tufail A. Evaluation of age-related macular degeneration with optical coherence tomography. Surv Ophthalmol 2012;57:389-414. Diabetic Retinopathy Clinical Research Network, Browning DJ, Glassman AR, Aiello LP, Beck RW, Brown DM, et al. Relationship between optical coherence tomography-measured central retinal thickness and visual acuity in diabetic macular edema. Ophthalmology 2007;114:525-36. Michaelides M, Kaines A, Hamilton RD, Fraser-Bell S, Rajendram R, Quhill F, et al. A prospective randomized trial of intravitreal bevacizumab or laser therapy in the management of diabetic macular edema (BOLT study) 12-month data: Report 2. Ophthalmology 2010;117:1078-86.e2. Mitchell P, Bandello F, Schmidt-Erfurth U, Lang GE, Massin P, Schlingemann RO, et al. The RESTORE study: Ranibizumab monotherapy or combined with laser versus laser monotherapy for diabetic macular edema. Ophthalmology 2011;118:615-25. Brown DM, Nguyen QD, Marcus DM, Boyer DS, Patel S, Feiner L, et al. Long-term outcomes of ranibizumab therapy for diabetic macular edema: The 36-month results from two phase III trials: RISE and RIDE. Ophthalmology 2013;120:2013-22. Nguyen QD, Shah SM, Khwaja AA, Channa R, Hatef E, Do DV, et al. Two-year outcomes of the ranibizumab for edema of the mAcula in diabetes (READ-2) study. Ophthalmology 2010;117:2146-51. Massin P, Bandello F, Garweg JG, Hansen LL, Harding SP, Larsen M, et al. Safety and efficacy of ranibizumab in diabetic macular edema (RESOLVE Study): A 12-month, randomized, controlled, double-masked, multicenter phase II study. Diabetes Care 2010;33:2399-405. Brown DM, Kaiser PK, Michels M, Soubrane G, Heier JS, Kim RY, et al. Ranibizumab versus verteporfin for neovascular age-related macular degeneration. N Engl J Med 2006;355:1432-44. Fung AE, Lalwani GA, Rosenfeld PJ, Dubovy SR, Michels S, Feuer WJ, et al. An optical coherence tomography-guided, variable dosing regimen with intravitreal ranibizumab (Lucentis) for neovascular age-related macular degeneration. Am J Ophthalmol 2007;143:566-83. Arnold JJ. Age-related macular degeneration: Anti-vascular endothelial growth factor treatment. BMJ Clin Evid 2016;2016. pii: 0701. Klein R, Wang Q, Klein BE, Moss SE, Meuer SM. The relationship of age-related maculopathy, cataract, and glaucoma to visual acuity. Invest Ophthalmol Vis Sci 1995;36:182-91. Siderov J, Tiu AL. Variability of measurements of visual acuity in a large eye clinic. Acta Ophthalmol Scand 1999;77:673-6. Fletcher DC, Schuchard RA. Visual function in patients with choroidal neovascularization resulting from age-related macular degeneration: The importance of looking beyond visual acuity. Optom Vis Sci 2006;83:178-89. Doris N, Hart PM, Chakravarthy U, McCleland J, Stevenson M, Hudson C, et al. Relation between macular morphology and visual function in patients with choroidal neovascularisation of age related macular degeneration. Br J Ophthalmol 2001;85:184-8. Querques G, Berboucha E, Leveziel N, Pece A, Souied EH. Preferential hyperacuity perimeter in assessing responsiveness to ranibizumab therapy for exudative age-related macular degeneration. Br J Ophthalmol 2011;95:986-91. Fukuda S, Okamoto F, Yuasa M, Kunikata T, Okamoto Y, Hiraoka T, et al. Vision-related quality of life and visual function in patients undergoing vitrectomy, gas tamponade and cataract surgery for macular hole. Br J Ophthalmol 2009;93:1595-9. Schuchard RA. Validity and interpretation of Amsler grid reports. Arch Ophthalmol 1993;111:776-80. Matsumoto C, Tsuboi S, Okuyama S, Uyama K, Otori T. Quantification of metamorphopsia. Method of evaluation. Rinsho Ganka 1990;44:271-4. Nowomiejska K, Oleszczuk A, Brzozowska A, Grzybowski A, Ksiazek K, Maciejewski R, et al. M-charts as a tool for quantifying metamorphopsia in age-related macular degeneration treated with the bevacizumab injections. BMC Ophthalmol 2013;13:13. Achiron A, Lagstein O, Glick M, Gur Z, Bartov E, Burgansky-Eliash Z. Quantifying metamorphopsia in patients with diabetic macular oedema and other macular abnormalities. Acta Ophthalmol 2015;93:e649-53. Nowacka B, Kirkiewicz M, Mozolewska-Piotrowska K, Lubinski W. The macular function and structure in patients with diabetic macular edema before and after ranibizumab treatment. Doc Ophthalmol 2016;132:111-22. Das R, Shi Y, Silvestri G, Chakravarthy U. Distortion maps from preferential hyperacuity perimetry are helpful in monitoring functional response to Lucentis therapy. Retina 2009;29:1013-8. Alster Y, Bressler NM, Bressler SB, Brimacombe JA, Crompton RM, Duh YJ, et al. Preferential Hyperacuity Perimeter (PreView PHP) for detecting choroidal neovascularization study. Ophthalmology 2005;112:1758-65. Goldstein M, Loewenstein A, Barak A, Pollack A, Bukelman A, Katz H, et al. 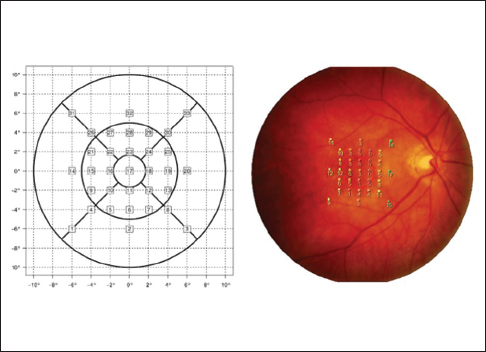 Results of a multicenter clinical trial to evaluate the preferential hyperacuity perimeter for detection of age-related macular degeneration. Retina 2005;25:296-303. Querques G, Querques L, Rafaeli O, Canoui-Poitrine F, Bandello F, Souied EH. Preferential hyperacuity perimeter as a functional tool for monitoring exudative age-related macular degeneration in patients treated by intravitreal ranibizumab. Invest Ophthalmol Vis Sci 2011;52:7012-8. Alexander P, Mushtaq F, Osmond C, Amoaku W. Microperimetric changes in neovascular age-related macular degeneration treated with ranibizumab. Eye (Lond) 2012;26:678-83. Scupola A, Tiberti AC, Sasso P, Savastano MC, Mastrocola A, Marangoni D, et al. Macular functional changes evaluated with MP-1 microperimetry after intravitreal bevacizumab for subfoveal myopic choroidal neovascularization: One-year results. Retina 2010;30:739-47. Munk MR, Kiss C, Huf W, Sulzbacher F, Roberts P, Mittermüller TJ, et al. One year follow-up of functional recovery in neovascular AMD during monthly anti-VEGF treatment. Am J Ophthalmol 2013;156:633-43. Parravano M, Oddone F, Tedeschi M, Chiaravalloti A, Perillo L, Boccassini B, et al. Retinal functional changes measured by microperimetry in neovascular age-related macular degeneration treated with ranibizumab: 24-month results. Retina 2010;30:1017-24. Cho HJ, Kim CG, Yoo SJ, Cho SW, Lee DW, Kim JW, et al. Retinal functional changes measured by microperimetry in neovascular age-related macular degeneration treated with ranibizumab. Am J Ophthalmol 2013;155:118-26.e1. Bolz M, Simader C, Ritter M, Ahlers C, Benesch T, Prünte C, et al. Morphological and functional analysis of the loading regimen with intravitreal ranibizumab in neovascular age-related macular degeneration. Br J Ophthalmol 2010;94:185-9. Ozdemir H, Karacorlu M, Senturk F, Karacorlu SA, Uysal O. Microperimetric changes after intravitreal bevacizumab injection for exudative age-related macular degeneration. Acta Ophthalmol 2012;90:71-5. Kriechbaum K, Prager F, Geitzenauer W, Benesch T, Schütze C, Simader C, et al. Association of retinal sensitivity and morphology during antiangiogenic treatment of retinal vein occlusion over one year. Ophthalmology 2009;116:2415-21. Papadia M, Misteli M, Jeannin B, Herbort CP. The influence of anti-VEGF therapy on present day management of macular edema due to BRVO and CRVO: A longitudinal analysis on visual function, injection time interval and complications. Int Ophthalmol 2014;34:1193-201. Malagola R, Spinucci G, Cofone C, Pattavina L. Prospective microperimetry and OCT evaluation of efficacy of repeated intravitreal bevacizumab injections for persistent clinically significant diabetic macular edema. Int Ophthalmol 2013;33:261-7. Vujosevic S, Torresin T, Bini S, Convento E, Pilotto E, Parrozzani R, et al. Imaging retinal inflammatory biomarkers after intravitreal steroid and anti-VEGF treatment in diabetic macular oedema. Acta Ophthalmol 2017;95:464-71. Comyn O, Sivaprasad S, Peto T, Neveu MM, Holder GE, Xing W, et al. A randomized trial to assess functional and structural effects of ranibizumab versus laser in diabetic macular edema (the LUCIDATE study). Am J Ophthalmol 2014;157:960-70. Yodoi Y, Tsujikawa A, Nakanishi H, Otani A, Tamura H, Ojima Y, et al. Central retinal sensitivity after intravitreal injection of bevacizumab for myopic choroidal neovascularization. Am J Ophthalmol 2009;147:816-24, 824.e1. Wang F, Wang W, Yu S, Wang W, Lu F, Xu F, et al. Functional recovery after intravitreal bevacizumab treatments for idiopathic choroidal neovascularization in young adults. Retina 2012;32:679-86. Maturi RK, Bleau LA, Wilson DL. Electrophysiologic findings after intravitreal bevacizumab (Avastin) treatment. Retina 2006;26:270-4. Stahl A, Feltgen N, Fuchs A, Bach M. Electrophysiological evaluation of retinal photoreceptor function after repeated bevacizumab injections. Doc Ophthalmol 2009;118:81-8. Moschos MM, Brouzas D, Apostolopoulos M, Koutsandrea C, Loukianou E, Moschos M. Intravitreal use of bevacizumab (Avastin) for choroidal neovascularization due to ARMD: A preliminary multifocal-ERG and OCT study. Multifocal-ERG after use of bevacizumab in ARMD. Doc Ophthalmol 2007;114:37-44. Pai SA, Shetty R, Vijayan PB, Venkatasubramaniam G, Yadav NK, Shetty BK, et al. Clinical, anatomic, and electrophysiologic evaluation following intravitreal bevacizumab for macular edema in retinal vein occlusion. Am J Ophthalmol 2007;143:601-6. Shetty R, Pai SA, Vincent A, Shetty N, Narayana KM, Sinha B, et al. Electrophysiological and structural assessment of the central retina following intravitreal injection of bevacizumab for treatment of macular edema. Doc Ophthalmol 2008;116:129-35. Ziemssen F, Lüke M, Messias A, Beutel J, Tatar O, Zrenner E, et al. Safety monitoring in bevacizumab (Avastin) treatment: Retinal function assessed by psychophysical (visual fields, colour vision) and electrophysiological (ERG/EOG) tests in two subgroups of patients. Int Ophthalmol 2008;28:101-9. Pedersen KB, Møller F, Sjølie AK, Andréasson S. Electrophysiological assessment of retinal function during 6 months of bevacizumab treatment in neovascular age-related macular degeneration. Retina 2010;30:1025-33. Macky TA, Mahgoub MM. Electrophysiological assessment of optic nerve and retinal functions following intravitreal injection of bevacizumab (Avastin). J Ocul Pharmacol Ther 2012;28:159-65. Yasuda S, Kachi S, Ueno S, Piao CH, Terasaki H. Flicker electroretinograms before and after intravitreal ranibizumab injection in eyes with central retinal vein occlusion. Acta Ophthalmol 2015;93:e465-8. Hood DC, Frishman LJ, Saszik S, Viswanathan S. Retinal origins of the primate multifocal ERG: Implications for the human response. Invest Ophthalmol Vis Sci 2002;43:1673-85. Zuo C, Wen F, Li J, Liu Y, Li M. Transitions of multifocal electroretinography following combined intravitreal bevacizumab and photodynamic therapy for polypoidal choroidal vasculopathy. Doc Ophthalmol 2009;119:29-36. Moschos MM, Moschos M. Intraocular bevacizumab for macular edema due to CRVO. A multifocal-ERG and OCT study. Doc Ophthalmol 2008;116:147-52. Karanjia R, Eng KT, Gale J, Sharma S, ten Hove MW. Electrophysiological effects of intravitreal Avastin (bevacizumab) in the treatment of exudative age-related macular degeneration. Br J Ophthalmol 2008;92:1248-52. Holm K, Schroeder M, Lövestam Adrian M. Peripheral retinal function assessed with 30-Hz flicker seems to improve after treatment with Lucentis in patients with diabetic macular oedema. Doc Ophthalmol 2015;131:43-51. Campa C, Hagan R, Sahni JN, Brown MC, Beare NA, Heimann H, et al. Early multifocal electroretinogram findings during intravitreal ranibizumab treatment for neovascular age-related macular degeneration. Invest Ophthalmol Vis Sci 2011;52:3446-51. Gardaševic Topcic I, Š uštar M, Brecelj J, Hawlina M, Jaki Mekjavic P. Morphological and electrophysiological outcome in prospective intravitreal bevacizumab treatment of macular edema secondary to central retinal vein occlusion. Doc Ophthalmol 2014;129:27-38. Ozkiris A. Pattern electroretinogram changes after intravitreal bevacizumab injection for diabetic macular edema. Doc Ophthalmol 2010;120:243-50. Oner A, Gumus K, Arda H, Yuce Y, Karakucuk S, Mirza E. Pattern electroretinographic results after photodynamic therapy alone and photodynamic therapy in combination with intravitreal bevacizumab for choroidal neovascularization in age-related macular degeneration. Doc Ophthalmol 2009;119:37-42. Moon CH, Ahn SI, Ohn YH, Kwak HW, Park TK. Visual prognostic value of photopic negative response and optical coherence tomography in central retinal vein occlusion after anti-VEGF treatment. Doc Ophthalmol 2013;126:211-9. Skaat A, Solomon A, Moroz I, Hai OV, Rechtman E, Vishnevskia Dai V, et al. Increased electroretinogram a-wave amplitude after intravitreal bevacizumab injection for neovascular age-related macular degeneration. Acta Ophthalmol 2011;89:e269-73. Patel PJ, Chen FK, Da Cruz L, Rubin GS, Tufail A; ABC Trial Study Group. Contrast sensitivity outcomes in the ABC trial: A randomized trial of bevacizumab for neovascular age-related macular degeneration. Invest Ophthalmol Vis Sci 2011;52:3089-93. Preti RC, Ramirez LM, Pimentel SL, Nakashima Y, Machado CG, Pelayes DE, et al. Effect of a single intravitreal bevacizumab injection on contrast sensitivity and macular thickness in eyes with macular edema from central retinal vein occlusion: A prospective, nonrandomized, three-month follow-up study. Ophthalmic Res 2014;51:140-5. Preti RC, Ramirez LM, Monteiro ML, Carra MK, Pelayes DE, Takahashi WY. Contrast sensitivity evaluation in high risk proliferative diabetic retinopathy treated with panretinal photocoagulation associated or not with intravitreal bevacizumab injections: A randomised clinical trial. Br J Ophthalmol 2013;97:885-9. Rubin GS, Bandeen-Roche K, Huang GH, Muñoz B, Schein OD, Fried LP, et al. The association of multiple visual impairments with self-reported visual disability: SEE project. Invest Ophthalmol Vis Sci 2001;42:64-72. Zuo C, Wen F, Li J, Liu Y, Long S, Huang S, et al. Functional changes following combined intravitreal bevacizumab and photodynamic therapy for polypoidal choroidal vasculopathy. Graefes Arch Clin Exp Ophthalmol 2010;248:191-6. Azad RV, Khan MA, Chanana B, Azad S. Intravitreal bevacizumab for subfoveal choroidal neovascularization secondary to age-related macular degeneration in an Indian population. Jpn J Ophthalmol 2008;52:52-6. IVAN Study Investigators, Chakravarthy U, Harding SP, Rogers CA, Downes SM, Lotery AJ, et al. Ranibizumab versus bevacizumab to treat neovascular age-related macular degeneration: One-year findings from the IVAN randomized trial. Ophthalmology 2012;119:1399-411. Pece A, Isola V, Piermarocchi S, Calori G. Efficacy and safety of anti-vascular endothelial growth factor (VEGF) therapy with intravitreal ranibizumab (Lucentis) for naive retinal vein occlusion: 1-year follow-up. Br J Ophthalmol 2011;95:56-68. Owsley C, Sloane ME. Contrast sensitivity, acuity, and the perception of 'real-world' targets. Br J Ophthalmol 1987;71:791-6. Kim J, Brown W, Maher JR, Levinson H, Wax A. Functional optical coherence tomography: Principles and progress. Phys Med Biol 2015;60:R211-37. Majander A, João C, Rider AT, Henning GB, Votruba M, Moore AT, et al. The pattern of retinal ganglion cell loss in OPA1-related autosomal dominant optic atrophy inferred from temporal, spatial, and chromatic sensitivity losses. Invest Ophthalmol Vis Sci 2017;58:502-16. Bethlehem RA, Dumoulin SO, Dalmaijer ES, Smit M, Berendschot TT, Nijboer TC, et al. Decreased fixation stability of the preferred retinal location in juvenile macular degeneration. PLoS One 2014;9:e100171. Aroney C, Fraser-Bell S, Lamoureux EL, Gillies MC, Lim LL, Fenwick EK. Vision-related quality of life outcomes in the BEVORDEX study: A clinical trial comparing ozurdex sustained release dexamethasone intravitreal implant and bevacizumab treatment for diabetic macular edema. Invest Ophthalmol Vis Sci 2016;57:5541-6.